Hay is grass cut and dried for use as food for animals. Josh drove past bales of hay drying in the fields. Hay is a big part of horses' diets. Many people, especially city folk, confuse straw and hay. 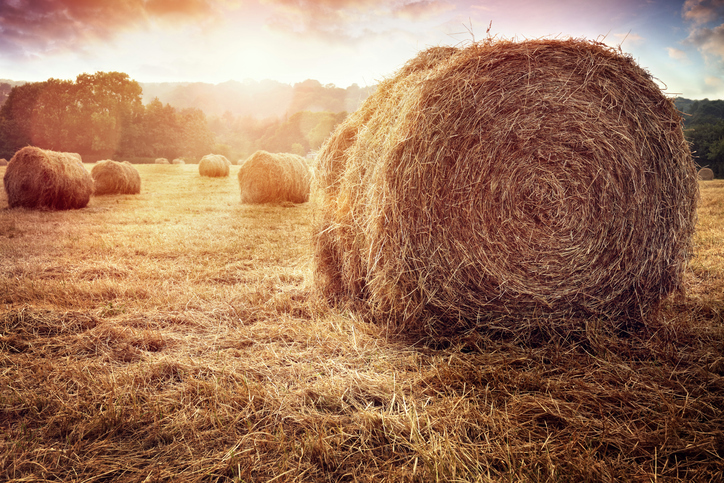 Straw is what is left over when you harvest grains, such as wheat, oats, and barley. It has little nutritional value and is used as bedding for animals and mulch (a covering around plants to prevent moisture loss). Hay is the entire plant of legumes including seeds, such as alfafa and clover and is used as feed for animals, such as horses. Haywire means ‘crazy’ or ‘out of control.’ In the movie Haywire, a betrayed agent devises a trap to stay alive, but things go haywire. Watch the trailer. There are other meanings of hay.